I've been in a bit of a recipe slump lately and I'm always looking for new ways to fix chicken. Both my husband and I love spinach artichoke dip and I figured why not combine it with chicken and make a meal out of it? I was able to create a diet friendly recipe and it was absolutely fantastic! Place your chicken in the bottom of the slow cooker. Season with garlic powder and salt. 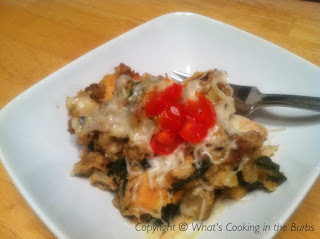 Add in your spinach, artichoke hearts, cream cheese, stuffing, and water. Cover and cook on low for 4-5 hours. During the last 30 minutes of cooking add in your shredded cheese. Enjoy! I plan to bookmark this and fix this later this month. Sounds delish! This looks tasty. I'm going to try it in the next few weeks. Pinning now! I just love your combination of Spinach and Artichoke with the Chicken to make this awesome Slow Cooker recipe. Hope you have a fabulous week and thank you so much for sharing with Full Plate Thursday. You put the spinach, cream cheese, artichokes, stuffing and water on top of the chicken in the slow cooker. It cooks along with the chicken.